There are many reasons to sell a business. Maybe you’re in ill health or ready to retire. Or you’re tired of working all the time and now that the business is profitable you’re ready to cash in. Whatever the reason, selling a small to medium sized business is a complex venture and many business owners are not aware of the tax consequences. If you’re thinking about selling your business the first step is to consult a competent tax professional. You will need to make sure your financials in order, obtain an accurate business valuation to determine how much your business is worth (and what the listing price might be), and develop a tax planning strategy to minimizes capital gains and other taxes in order to maximize your profits from the sale. The importance of preparing your business financials before listing your business for sale cannot be overstated. Whether you use a business broker or word of mouth, rest assured that potential buyers will scrutinize every aspect of your business. Not being able to quickly produce financial statements, current and prior years’ balance sheets, profit and loss statements, tax returns, equipment lists, product inventories, and property appraisals and lease agreements may lead to loss of the sale. Many business owners have no idea what their business is worth; some may underestimate whereas others overestimate–sometimes significantly. Obtaining a third party business valuation allows business owners to set a price that is realistic for potential buyers, while achieving maximum value. As a business owner you probably think of your business as a single entity sold as a lump sum. The IRS however, views a business as a collection of assets. Profit from the sale of these assets (i.e. your business) may be subject to short and long-term capital gains tax, depreciation recapture of Section 1245 and Section 1250 real property, and federal and state income taxes. Your business structure (i.e. business entity) also affects the way your business is taxed when it is sold. Sole proprietorships, partnerships, and LLCs (Limited Liability Companies) are considered “pass-through” entities and each asset is sold separately. As such there is more flexibility when structuring a sale to benefit both the buyer and seller in terms of tax consequences. C-corporations and S-corporations have different entity structures and sale of assets and stock are subject to more complex regulations. As you can see, selling a business involves complicated federal and state tax rules and regulations. If you’re thinking of selling your business in the near future don’t hesitate to call the office and schedule a consultation with a tax and accounting professional. Whether you’ve just started a nonprofit, recently submitted your organization’s first Form 990, or are the executive director, it’s important not to lose sight of your obligations under federal and state tax laws. From annual filing and reporting requirements to taxes on business income and payroll compliance, here’s a quick look at what nonprofits need to know about tax compliance. Once you’ve applied for and received tax-exempt status under (Section 501(c)(3) and filed Form 1023, Application for Recognition of Exemption Under Section 501(c)(3) of the Internal Revenue Code, and received your exemption letter from the IRS, your organization is officially a nonprofit, and is exempt from federal income tax under section 501(c)(3). Tax exempt status refers to exemption from federal income tax on income related to the organization’s mission, as well as the ability to receive tax-deductible contributions from donors. The next step is to comply with annual filing and reporting requirements, specifically, Form 990, Return of Organization Exempt from Income Tax. Generally, tax-exempt organizations are required to file annual returns. If an organization does not file a required return or files late, the IRS may assess penalties. In addition, if an organization does not file as required for three consecutive years, it automatically loses its tax-exempt status. Note: Certain organizations such as churches (including church-affiliated organizations and schools operated by a religious order) as well as organizations affiliated with a governmental unit are not required to file Form 990. Refer to your IRS exemption letter if you’re not sure. There are four different Forms 990; which form an organization must file generally depends on its gross receipts. Forms 990-EZ or 990 are used for organizations with gross receipts of less than $200,000 and with total assets of less than $500,000. Form 990 is used for nonprofits with gross receipts greater than or equal to $200,000 or total assets greater than or equal to $500,000. When gross receipts are less than or equal to $50,000, certain small organizations may file an annual electronic notice, the Form 990-N (e-Postcard); however, organizations eligible to file the e-Postcard may choose to file a full return. Private foundations file Form 990-PF regardless of financial status. Form 990 is submitted to the IRS five and a half months after the end of an organization’s calendar year. For example, for nonprofits whose calendar year ends on December 31st, the initial return due date for Form 990 is May 15. If a due date falls on a Saturday, Sunday, or legal holiday, the due date is delayed until the next business day. Extended due dates of three and six months are available for Forms 990; however, for Form 990-N the due date is the “initial return due date,” e.g. May 15 and extended due dates do not apply. NOTE: Unlike individual tax returns filed with the IRS, which may be postmarked on April 15, Forms 990 must be received (not postmarked) by the IRS before the May 15 due date. Unrelated business income is defined as income from a trade or business which is regularly carried on and is not substantially related to the charitable, educational, or other purpose that is the basis of the organization’s exemption. While it may come as a surprise to some, nearly all tax-exempt organizations are required to pay taxes on unrelated business income, which might include proceeds from an annual holiday card sale or souvenirs related to an educational exhibit in support of the nonprofit’s mission. If the IRS determines that a nonprofit is significantly underreporting income from unrelated business activities, it may lose its tax-exempt status. Similar to for-profit companies, nonprofit organizations must comply with both federal and state payroll reporting requirements. Federal tax withholding, social security taxes, and Medicare taxes must be deposited through the Electronic Federal Tax Payment System (“EFTPS”), and the organization must file Form 941 on a quarterly basis. Nonprofits are also required to report reimbursements to employees for out-of-pocket expenses; however, nonprofits that create an accountable reimbursement plan or ARP that meets IRS guidelines are able to avoid these reporting requirements. Most nonprofit organizations incorporate before applying to the IRS for tax exempt status. As such, they must comply with state laws such as annual or periodic registrations. Each state has different laws, but in general, nonprofit organizations must update basic contact information including mailing address, names of responsible parties, and registered agents. Some states require that charitable organizations apply for sales/use or property tax exemptions as well. Further, charitable organizations that solicit donations in a particular state are subject to state solicitation laws that require the nonprofit to register with the state(s) and to report on the nonprofit’s fundraising activities. For nonprofits that solicit donations from residents in more than one state, compliance is often challenging. Organizations that fail to register are subject to hefty penalties. These are just a few of the tax-compliance issues facing nonprofit organizations. If you have any questions, would like more information, or need help setting up an accountable reimbursement plan that meets IRS requirements, please call. Between mortgages, car loans, credit cards, and student loans, most people are in debt. While being debt-free is a worthwhile goal, most people need to focus on managing their debt first since it’s likely to be there for most of their life. Handled wisely, however, that debt won’t be an albatross around your neck. You don’t need to shell out your hard-earned money because of exorbitant interest rates or always feel like you’re on the verge of bankruptcy. You can pay off debt the smart way, while at the same time, saving money to pay it off even faster. Record the day the debt began and when it will end (if possible), the interest rate you’re paying, and what your payments typically are. Next, add it all up–as painful as that might be. Try not to be discouraged! Remember, you’re going to break this down into manageable chunks while finding extra money to help pay it down. Yes, some debts are more expensive than others. Unless you’re getting payday loans (which you shouldn’t be), the worst offenders are probably your credit cards. Here’s how to deal with them. Don’t use them. Don’t cut them up, but put them in a drawer and only access them in an emergency. Identify the card with the highest interest and pay off as much as you can every month. Pay minimums on the others. When that one’s paid off, work on the card with the next highest rate. Don’t close existing cards or open any new ones. It won’t help your credit rating, and in fact, will only hurt it. Go over your credit-card statements with a fine-tooth comb. Are you still being charged for that travel club you’ve never used? Look for line items you don’t need. Do you really need the 200-channel cable option or that satellite dish on your roof? You’ll be surprised at what you don’t miss. How about magazine subscriptions? They’re not terribly expensive, but every penny counts. It’s nice to have a library of books, but consider visiting the public library or half-price bookstores until your debt is under control. Not only are you retiring debt, but you’re also building a stellar credit rating. If you ever move or buy another car, you’ll want to get the lowest rate possible. A blemish-free payment record will help with that. Besides, credit card companies can be quick to raise interest rates because of one late payment. A completely missed one is even more serious. To avoid increasing debt load, make it a habit to pay for everything you purchase with cash. If you don’t have the cash for it, you probably don’t need it. You’ll feel better about what you do have if you know it’s owned free and clear. If your family is large enough to warrant it, invest $30 or $40 and join a store like Sam’s or Costco–and use it. Shop there first, then at the grocery store. Change brands if you have to and swallow your pride. If you’re concerned about buying organic, rest assured that even at places like Costco you will have many options. Use coupons religiously. Calculate the money you’re saving and slap it on your debt. Each of these steps, taken alone, probably doesn’t seem like much, but if you adopt as many as you can, you’ll watch your debt decrease every month. If you need help managing debt, please call for assistance. You may be tempted to forget about your taxes once you’ve filed your tax return, but did you know that if you start your tax planning now, you may be able to avoid a tax surprise when you file next year? 1. Take action when life changes occur. Some life events such as a change in marital status or the birth of a child can change the amount of tax you pay. When they happen, you may need to change the amount of tax withheld from your pay. To do that, file a new Form W-4, Employee’s Withholding Allowance Certificate, with your employer. Call if you need help filling out the form. 2. Report changes in circumstances to the Health Insurance Marketplace. If you enroll in insurance coverage through the Health Insurance Marketplace in 2016, you should report changes in circumstances to the Marketplace when they happen. Reporting events such as changes in your income or family size helps you avoid getting too much or too little financial assistance in advance. 3. Keep records safe. Print and keep a copy of your 2015 tax return and supporting records together in a safe place. This includes W-2 Forms, Forms 1099, bank records and records of your family’s health care insurance coverage. If you ever need your tax return or records, it will be easier for you to get them. For example, you may need a copy of your tax return if you apply for a home loan or financial aid for college. You should use your tax return as a guide when you do your taxes next year. 4. Stay organized. Make tax time easier on everyone by having your family place tax records in the same place during the year. That way you won’t have to search for misplaced records when you file your return next year. 5. Consider itemizing. You may be able to lower your taxes if you itemize deductions instead of taking the standard deduction. Owning a home, paying medical expenses and qualified donations to charity could mean more tax savings. A list of deductions is found in the instructions for Schedule A, Itemized Deductions. As always, if you have any questions please call. Ready to save money on your taxes? Planning now can pay off with savings at tax time next year. Call today and get a jump start on next year’s taxes. If you give money or goods to a charity in 2016, you may be able to claim a deduction on your federal tax return. Here are six important facts you should know about charitable donations. 1. Qualified Charities. You must donate to a qualified charity. Gifts to individuals, political organizations or candidates are not deductible. An exception to this rule is contributions under the Slain Officer Family Support Act of 2015. To check the status of a charity, use the IRS Select Check tool found on IRS.gov. 5. Form to File and Records to Keep. You must file Form 8283, Noncash Charitable Contributions, for all noncash gifts totaling more than $500 for the year. If you need to prepare a Form 8283, you can prepare and e-file your tax return for free using IRS Free File. The type of records you must keep depends on the amount and type of your donation. To learn more about what records to keep please call the office. Questions about deducting charitable donations? Call the office anytime. We’re here to help. Many people use a tax professional to prepare their taxes. Tax professionals with an IRS Preparer Tax Identification Number (PTIN) can prepare a return for a fee. If you choose a tax pro, you should know who can represent you before the IRS. There are new rules this year, so the IRS wants you to know who can represent you and when they can represent you. Limited representation rights authorize the tax professional to represent you if, and only if, they prepared and signed the return. They can do this only before IRS revenue agents, customer service representatives and similar IRS employees. They cannot represent clients whose returns they did not prepare. They cannot represent clients regarding appeals or collection issues even if they did prepare the return in question. For returns filed after Dec. 31, 2015, the only tax return preparers with limited representation rights are Annual Filing Season Program Participants. The Annual Filing Season Program is a voluntary program. Non-credentialed tax return preparers who aim for a higher level of professionalism are encouraged to participate. Are you planning to pay for college in 2016? If so, money you paid for higher education can mean tax savings on your tax return when you file next year. If you, your spouse or your dependent took post-high school coursework last year, you may be able to take advantage of education credits that can help you with the cost of higher education. Taking advantage of these education tax credits can mean tax savings on your federal tax return by reducing the amount of tax you owe. Here are some important facts you should know about education tax credits. The credits apply to an eligible student. Eligible students include you, your spouse or a dependent that you list on your tax return. Your school should give you a Form 1098-T, Tuition Statement, by February 1, 2017, showing expenses for the year. This form contains helpful information needed to complete Form 8863. The amounts shown in Boxes 1 and 2 of the form may be different than what you actually paid. For example, the form may not include the cost of books that qualify for the credit. Use the Interactive Tax Assistant tool at IRS.gov to see if you’re eligible to claim these education tax credits. Even if you can’t take advantage of any of these tax credits, there could be other education-related tax benefits that you can claim. Call the office if you have any questions. 1. Deadline Extensions. Some members of the military, such as those who serve in a combat zone, can postpone some tax deadlines. If this applies to you, you can get automatic extensions of time to file your tax return and to pay your taxes. For example, service members stationed abroad have extra time (until June 15) to file a federal income tax return. Those serving in a combat zone have even longer, typically until 180 days after they leave the combat zone. They may also qualify to delay payment of income tax due before or during their period of service. Please call the office for details, including how to request relief. 2. Combat Pay Exclusion. If you serve in a combat zone, certain combat pay you receive is not taxable. You won’t need to show the pay on your tax return because combat pay isn’t included in the wages reported on your Form W-2, Wage and Tax Statement. Service in support of a combat zone may qualify for this exclusion. 3. Earned Income Tax Credit (EITC). If you get nontaxable combat pay, you may choose to include it to figure your EITC. You would make this choice if it increases your credit. Even if you do, the combat pay stays nontaxable. 10. Retirement Savings. Low-and moderate-income service members who contribute to an IRA or 401(k)-type retirement plan, such as the federal government’s Thrift Savings Plan, can often claim the saver’s credit, also known as the retirement savings contributions credit, on Form 8880, Credit for Qualified Retirement Savings Contributions. Although most military bases offer free tax preparation and filing assistance during the tax filing season, you may need to contact an accounting professional during other times of the year. Don’t hesitate to contact the office with any questions you have about your taxes–no matter what time of the year it is. How do you let your customers know how much they owe you, and for what products or services? In these days of ecommerce and merchant accounts, your customers may provide a credit card number over the phone or on a website. Or perhaps you send invoices after a sale and receive checks or account numbers in the mail. QuickBooks can help you both create the invoices and record the payments. There’s another type of sales document that you can use in certain situations: the sales receipt. You’d probably be most likely to use one of these when customers pay you in full for products or services at the same time they receive them. Figure 1: If you receive full payment for a product or service at the same time the customer receives it, you should use a sales receipt. Completing a sales receipt is similar to filling out an invoice or purchase order. Click Create Sales Receipts on QuickBooks’ home page or open the Customers menu and select Enter Sales Receipts. A screen like the one above will open. Choose a Customer from the drop-down list and a Class (if applicable). If you have created more than one Template (more on that later), make sure that the correct one appears in the field. Verify that the appropriate Date and Sale No. read as they should. Click on the type of payment you’re receiving, and enter the check or credit card number where necessary (a small window will open for the latter). Note: If you are working with a type of payment that does not appear in the four icons, click on the arrow below More to add it. Now you’re ready to select the products or services you sold by clicking on the arrow in the field under Item to open the available list (if you have not created a record for what you’re selling, select and complete the fields in the New Item window that opens). Enter the quantity (Qty. ). The Rate, Amount, and Tax fields should fill in automatically, based on the information you entered when you create the item’s record. When you’ve entered all of the items that the customer is paying you for, you can choose which Customer Message will appear on the sales receipt (you can see your options in the drop-down list found in the lower left corner of the screen). Anything you enter in the Memofield will be for your internal use only; it will not appear on the printed or emailed sales receipt. Click Save & Close or Save & New. 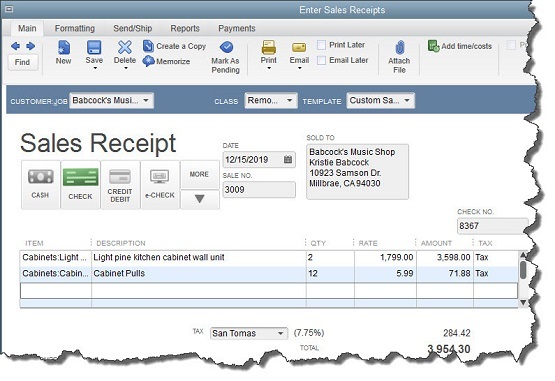 Figure 2: QuickBooks provides tools for customizing forms, including sales receipts. QuickBooks’ forms contain the fields most often used by small businesses. But you can alter them in numerous ways to meet your company’s needs. 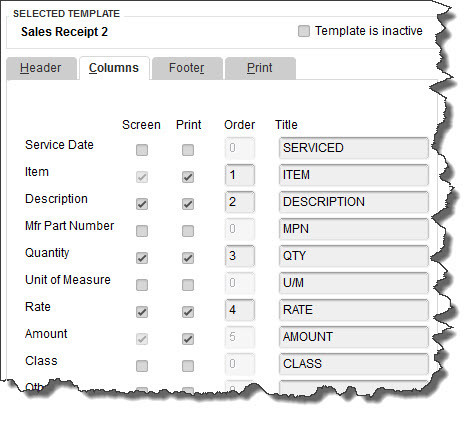 To customize a sales receipt, open the Sales Receipt window and click on the Formatting menu. Select Manage Templates. You’ll want to make a copy of the original sales receipt so that the original will always be available. Click the Copy button in the lower left. “Copy of Custom Sales Receipt” appears in the list of templates. In the Preview pane on the right, click in the field next to Template Name and replace the existing name with a new, more descriptive one if you’d like. Click OK. The Basic Customization window opens. Click on Additional Customization at the bottom of the screen. You’ll see a window like the one in the image above. Click the Columns tab. The list on the left displays all of the columns that can be included in the body of your sales receipt. Click in the boxes below Screen and Print to indicate which columns should display on your QuickBooks screen and which should appear on the customer’s copy. The numbers in the Order column can be changed to reflect which column will come first, second, etc. There’s a lot more you can do to customize your QuickBooks forms. And there are other situations where you might want to issue a sales receipt. If you would like to explore these and other elements of QuickBooks, please call the office to schedule a time that is convenient for you. Employers – Social Security, Medicare, and withheld income tax. File Form 941 for the second quarter of 2016. Deposit any undeposited tax. (If your tax liability is less than $2,500, you can pay it in full with a timely filed return.) If you deposited the tax for the quarter in full and on time, you have until August 10 to file the return. Employers – If you maintain an employee benefit plan, such as a pension, profit-sharing, or stock bonus plan, file Form 5500 or 5500-EZ for calendar-year 2015. If you use a fiscal year as your plan year, file the form by the last day of the seventh month after the plan year ends. Certain Small Employers – Deposit any undeposited tax if your tax liability is $2,500 or more for 2016 but less than $2,500 for the second quarter.